This knife is specially designed for producers and / or packing stations supplying the UK (super) market. 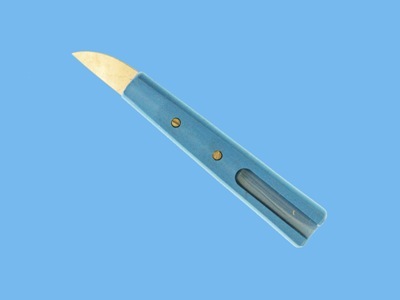 This knife features a blue plastic handle (wood is unsanitary) and provided with a recess in the handle for registration of the name and / or number. The standard fishing knife are mounted 15 mm deeper in the special handle, allowing you to work better, faster and without damaging the peppers. Other replacement blades with semi- circular or round top can be mounted in the handle.